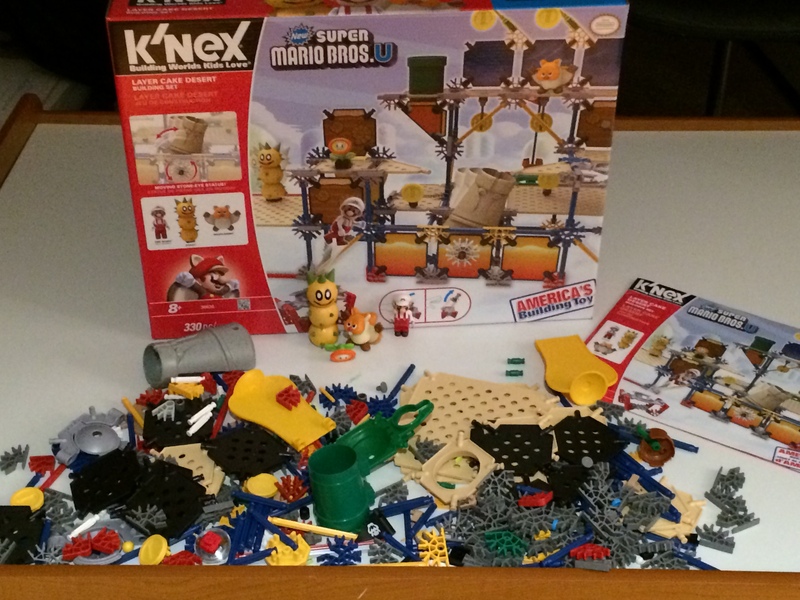 Christmas came a little early for my kids when we received a package this weekend containing the K’NEX Model Building Set and Super Mario Layer Cake Desert Building Set. I’ve always been a huge fan of any construction sets as it fosters my children’s creativity. I’ve seen my boys build and design so many different types of vehicles and buildings, including an army of dinosaur planes. You can’t get that with most other types of toys. The K’NEX brand is new to them so this should bring their imaginative play to a whole new level! He is excited to turn his video game experience into something real life and tangible. My son is right – even though the box comes with instructions containing 70 model ideas, the possibilities are endless! The biggest reason why I’m such a fan? It brings my 2 sons together, peacefully. They are actually able to sit in a room together and build for hours…without arguing! It helps them focus and truly challenges their inner creative souls. I also want to add that even though I’m focusing on my sons here, these building sets are definitely awesome for any boy OR girl. My sons just happened to steal the box away before their older sister was able to get her hands on it so I wasn’t able to get her opinion! Since we just received these sets, I don’t have pictures of any completed projects yet but I’m very much looking forward to seeing their creations. 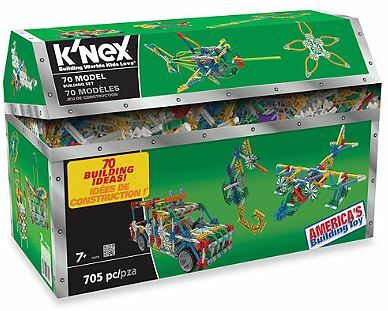 For more information about K’NEX and their extensive line of products, please visit their website at http://www.knex.com/. Founded in 1992, K’NEX Brands was established to make and sell what has become one of the world’s leading integrated construction systems for children. Winner of over 250 international awards and recognitions, K’NEX is America’s Building Toy™ company focused on Building Worlds Kids Love™, and encourages youngsters to “imagine, build and play.” From the living room to the classroom, K’NEX has building toys specially designed for every age group and skill level. The K’NEX family of brands includes K’NEX Building Sets, K’NEX Thrill Rides, K’NEX Education: America’s STEM building solution, Lincoln Logs®, Tinkertoy®, NASCAR®, Angry Birds™, Mario Kart Wii™, Mario Kart 7™, Super Mario™, PacMan™ and more. Disclosure: I received K’NEX toys as samples for review purposes only; no other compensation was received for this post. All opinions expressed are my own. QUEENS NY – February 14, 2014 Looking for the perfect camp for kids but don’t know where to start? 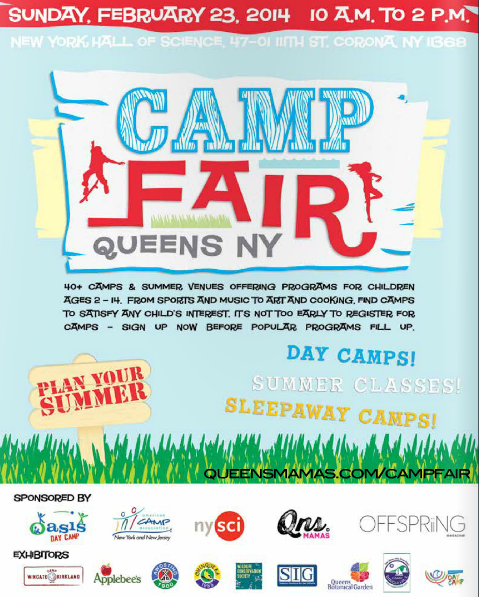 The Queens NY Camp Fair is a free event for families who are seeking day camps, sleep-away camps and specialty camps for Queens and Long Island families with kids ages 2-18. Now is the time to research and register for summer camps before spots fill up. Sponsored by Queens Mamas, Offspriing Magazine, New York Hall of Science, Oasis Day Camps and American Camp Association NY & NJ, the Queens NY Camp Fair will offer 30+ vendors with samplings and demonstrations to find the best camps for children ranging from the toddler to high school years. From sports and music to art and cooking, there will be camps to satisfy any child’s interest. Visit exhibitors such as 82nd St. Academics, Adirondack Woodcraft Camps, Applebee’s, Berkshire Hills Eisenberg Camps, Beth Sholom Day Camp, Camp Birch Hill, Camp Chinqueka and Camp Awosting, Camp Wingate & Kirkland, Frost Valley YMCA, Mid Island Air Service Aero Camp, Museum of the Moving Image, NY Cosmos, Summer Institute for the Gifted, Urbansitter, Usdan Center, USTA, Wildlife Conservation Society, and more! When: Sunday, February 23, 10 a.m. to 2 p.m. I think that Glitzi Globes are a craft that most children would like to do. They are fun, easy, and of course, glitzy! When I first saw it on the TV commercial, I thought it was really cool. My mom surprised me on my birthday party: she bought us Glitzi Globes! I was so happy! My friends and I tried it out right away. 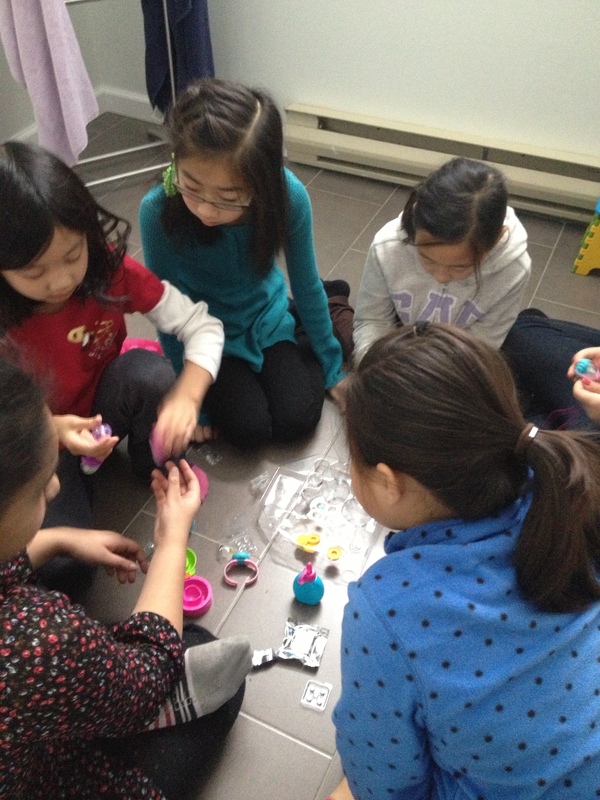 It was a bit crowded, though, because we created our globes in a small area and we had 6 girls. We loved our globes when we finished them! My friends and I stuck the globes onto bases to form rings, necklaces, and watches. We had to work together. We managed to do it with teamwork. We had to put a glass container into a slot, then place 3 charms in the glass container. Then we had to fill it with water. We then put a glitter pellet inside the container. We put a colored base into the slot next to it. We placed an animal on top of the base. We closed the globe maker firmly. Finally, we opened it up, took the globe out, placed it on a watch, ring, or necklace, then wore it. It was really easy. It is a good party activity because everyone has something to do. We were so happy! Every time we shook it, it became sparkly all over! As you can see, that is why my friends and I love Glitzy Globes!!! I received a Glitzi Globe Three Pack (retails for about $7.99) to review and needed to purchase additional packs so that there were enough for the girls to do as a craft at my daughter’s birthday party. It was a hit – the girls were able to work together and share without any fuss and the biggest plus – there was barely any mess to clean up afterwards! I also like the fact that everything you need is in one package (with exception of water!) The 3-pack included enough materials to create 3 snow globes (domes, bases, glitter tablet, nine floating charms, and instructions). No additional tools were necessary to assemble the globes. Moose Toys, creators of popular arts & crafts products, introduces Glitzi Globes, a cute new product line that brings magic to children’s hands by creating mini, collectible snow globes. Girls simply use the included materials to assemble each adorable miniature glittery globe that they can pop, swap, share and wear! 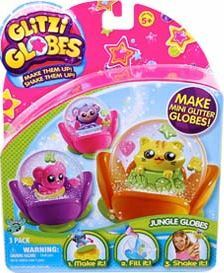 Glitzi Globes are available at various retailers, including Amazon, Toys “R” Us, and Walmart. Disclosure: I received Glitzi Globes as a sample for review purposes; no other compensation was received for this post. All opinions expressed are my own. 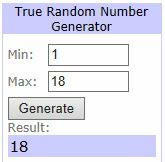 Congratulations to Jaclyn and Mei for winning the ZowPow Toys Plush Toy Controller for Mobile Games giveaway! Thank you to everyone who entered and happy holidays!! My brother “Shoe”, the gaming guru, recently introduced me to ZowPow Toys, winners of VentureBeat’s 5th Annual GamesBeat 2013 Who’s Got Game Innovation Showdown competition. ZowPow Toys beat out 40 other startups with their newest innovation, adorable plush toy controllers for mobile games. 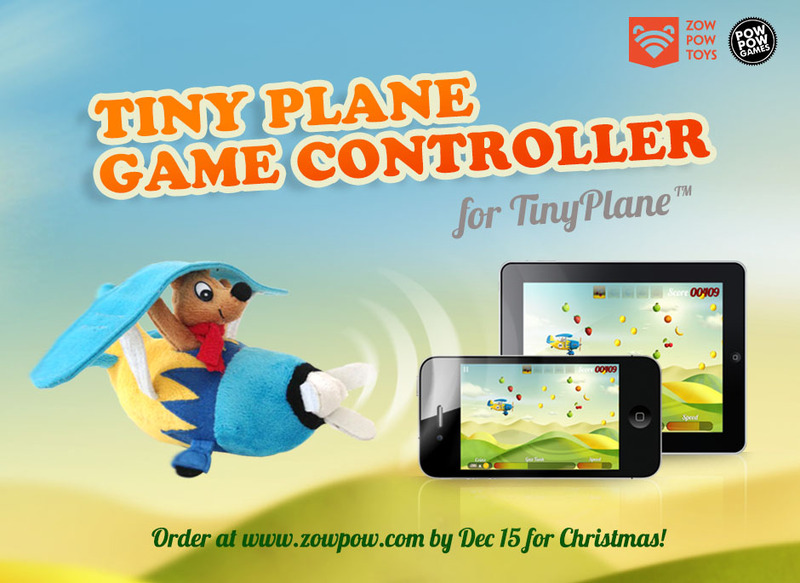 They officially launched the Tiny Plane Game Controller today, a plush toy in the shape of an airplane and contains ZowPow’s proprietary sensor technology that allows the player to control the in-game airplane shown on-screen by moving the toy around. NOTE: Currently these controllers only works with iOS devices. Android compatibility will be available soon. The $24.99 limited edition Tiny Plane Game Controller is now available at http://www.zowpow.com and will ship in time for Christmas if ordered by December 15. However, ZowPow Toys is generously allowing me to give away TWO Tiny Plane Plush Game Controllers – perfect timing for a last minute holiday gift for your young gaming enthusiast! To enter, please simply leave a comment below sharing why you or your gift recipient would love Tiny Plane! (This is a mandatory entry-this must be completed before any additional entries count). This giveaway is only open to U.S. residents 18 years and older. Giveaway will end on Sunday, December 15, 2013 at 12:00pm EST – comments submitted after that will not count. 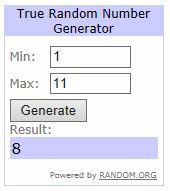 Two lucky winners will be selected randomly by random.org and be notified via e-mail; winner must respond within 24 hours or a new one will be selected. Good luck! ZowPow, Inc. is a technology company and toy designer, manufacturer and marketer. The company combines physical objects with sensor and mobile technologies to create the next generation of interactive toys. ZowPow believes that even little things, like a stuffed animal or toy, could make a big difference to kids and put a smile on their face. For every toy that ZowPow sells in December, they will be giving one away to a sick or underprivileged child. For more information, please visit www.zowpow.com. DISCLOSURE: No compensation was received for this post. All opinions expressed are my own. Kwizniak Kidz is a great game to play. It can be played with all ages, even adults! Trivia is a fun game that can be played at all times. You can play it anywhere! It is played with several cards, and the brain. There are 5 clues on the card. When the person is given the first clue, the opponent has to guess the subject of the clues. If the person guesses the right answer on the first try, you get more points than if you answered it using more clues. I think people should play it. If a child wants to know how smart they are, but doesn’t want to take a test, he/she should play Kwizniac. I recommend it for people because the person is given 5 clues. That will make it fun, challenging and maybe you could surprise your parents showing them how smart you are! So get Kwizniac, then test your friends! 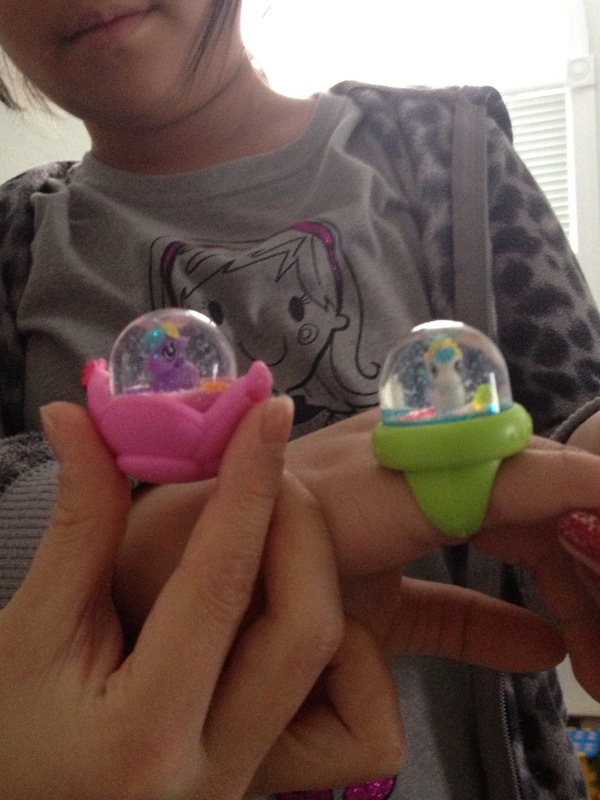 Note from mommylok: Needless to say, Kwizniac Kidz is a hit with my daughter. That makes it a hit with me! Kwizniac Kids is appropriate for ages 7+ and there’s also a version for ages 12+ (10 clues are used instead of 5). The object of the game is for players to accumulate as many points as possible by correctly answering as many trivia questions as possible. To help players correctly identify the answer to each question, a set of 10 clues is provided in decreasing order of difficulty, where each clue is easier to decipher than the previous clue in sequence. For the Kidz edition, there would be only 5 clues. The number of points a player receives for a correct answer decreases as he or she progresses through the sequence of clues. The player with the highest score wins the game. Kwizniac was created and designed for The Brand Cafe by L.A. Inc., a Canadian marketing and communications agency with expertise in branding, graphic design, advertising and promotion. It is a purely Canadian concept and designed by designers. The game is simple to understand and easy to play. 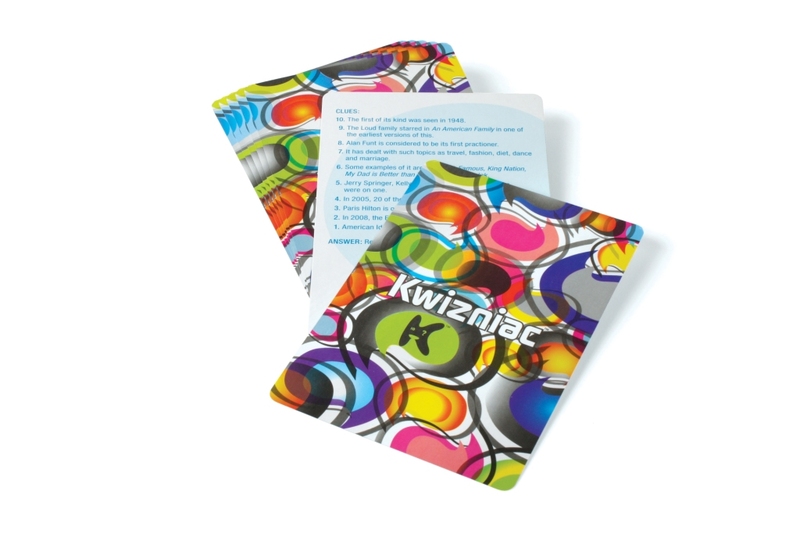 Because the game consists of only cards and the players’ brain power, Kwizniac can be played everywhere and at any time. It can be played at home on a Sunday evening with family and/or friends, in the car on a long road trip, in the park, by the pool. Kwizniac can be played with two people or with a group. There are no limitations to how, where and when Kwizniac can be played. Disclosure: I received Kwizniak as a sample for review purposes; no other compensation was received for this post. All opinions expressed are my own. I recently attended a Media Party for Smashburger’s newest Long Island location in New Hyde Park. This Smashburger, the fourth location in Long Island that’s opened up for the franchise in the last year and a half, has an inviting, contemporary look that doesn’t make it feel like a typical greasy fast food joint. Because it’s not. It’s family-friendly; after you place your order, you sit and wait as food is served to you at your table. It was pretty much a full restaurant experience at a “quick” food joint. Smashburger also uses fresh, never frozen Angus beef. The food was delicious and the service was super friendly! I loved the menu variety; there are burger, chicken, sides and salad options, as well as different bun types (brioche, multi-grain, spicy chipotle, egg). If that wasn’t enough, they also offer Haagen Dazs shakes! I can go on and on about the restaurant but bottom line – this place is a winner for me and my family, and we’ll definitely be going back. The best way to way to get a feel for what I mean is for you to try it yourself. And I’m offering you the chance to do so by entering to win free Smashbucks! Please read the giveaway guidelines below for entry options. Good luck! To win a family four-pack of Smashbucks (valued at $20), please simply leave a comment below sharing which menu item is your favorite! You can view the menu here. (This is a mandatory entry-this must be completed before any additional entries count). This giveaway is only open to U.S. residents 18 years and older. Giveaway will end on Sunday, November 10, 2013 at 12:00pm EST – comments submitted after that will not count. 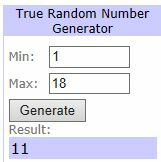 One lucky winner will be selected randomly by random.org and be notified via e-mail; winner must respond within 48 hours or a new one will be selected. Good luck! Smashburger is America’s fastest growing, fast casual “better burger” restaurant with 237 corporate and franchise restaurants operating in 30 states and in four international countries. The company began in 2007. By offering fresh, premium “smashed to order” burgers, chicken sandwiches, salads, signature side items and hand-spun Haagen-Dazs shakes, Smashburger has modernized the way people think about burgers. Known for localizing its menu in every market with regionally inspired burgers and side items and offering local craft beers, Smashburger has received numerous awards including topping Fast Casual’s 2012 Top Mover & Shakers list, America’s Most Promising Company by Forbes magazine, INC. 500’s List of America’s Fastest Growing Companies INC’s #9 Hire Power Award winner, and is regularly voted “best burger’ in cities all around the world. To learn more, visit www.smashburger.com. DISCLOSURE: I was invited to a media grand opening party; no other compensation was received for this post. All opinions expressed are my own. Hopefully you’ve been following my blog or tweets lately and know that “bullying” is an issue that means a lot to me. Even though October is National Bullying Prevention Month, this isn’t an issue that should be recognized or talked about in just the month of October. To help carry the conversation, I am co-hosting a Twitter Party with Maria Wen Adcock of Bicultural Mama and Onica Cupido of The Mommy Factor. Together with Joe Scarola, President of Gracie Barra Long Island (a school that teaches self-defense, self confidence, anti-bullying techniques and more through Brazilian Jiu-Jitsu), we are aiming to bring awareness about this issue so we can help protect our children. Please join us for this important chat, empowering our children through education and awareness is one of the best things we can do for them. The New York Birthday Show comes to the New York Hall of Science in Queens on October 20, 2013 with the biggest birthday party ever to provide families with tons of birthday experiences under one roof. Open to parents and children of all ages, attendees will have a blast at the ultimate birthday party and receive unprecedented insider access to some of the best entertainment, hands on activities, dessert samples, and DIY products currently available in the area. From finding great birthday party venues to creating a party all on your own, attendees will receive an exclusive look at the great ways to celebrate all occasions with their child/children. The New York Birthday Show is presented by The Mamas Network, RCN, Luna Park at Coney Island, Carlo’s Bakery (TLC’s Cake Boss), Glitzy Chicks Spa Parties, and OFFSPRiiNG Magazine. Sponsors include: Crumbs Bake Shop, Winter Village at Bryant Park, Lakeside at Prospect Park, Fantasy Forest at the Flushing Meadows Carousel, and Balloon Kings. ● Tons of amazing giveaways from the show’s over 65 exhibitors including fabulous prizes like a $500 spa birthday party from Glitzy Chicks Spa Parties, 2 hour face painting package worth $150 from ShellBell Face Painting, a 1 hour clowning package worth $300 from Bubbles the Clown and more! ● All kids who come in costume receive a free trick or treat bag to collect goodies from our exhibitors. To see the current online giveaways and for more information about the event, please visit www.nybirthdayshow.com. The Mamas Network is a series of online resources and social communities built by parents for parents including websites, events, and social media hubs. By using local experts and real parent reviews we have built a community where parents can connect. The Mamas Network includes Queens Mamas, Brooklyn Mamas, Long Island Mamas, Offspriing Magazine and the upcoming 2014 Mamas Expo. Visit www.themamasnetwork.com for more information. For directions, and other information, visit http://www.nysci.org/ or call 718-699-0005. Disclosure: I received media passes to attend this event in exchange for event coverage. No other compensation was received for this post.